which is the most severe designation. We hope to continue for many years, increasing our range and scope. WH2O supports Sammythe Steelhead Trout as he promotes clean water in San Luis Obispo County. Sage ECO-Gardens hosted our April 10, 2010 event called, "Save Water - Save Money." Josh Carmichael and SLO GreenGoods Mikel Robertson demo-ed the proper way to use washing machine graywater and discussed the plants that do best with it. ECOSLO had information on worm bin composting. The Los Osos CSD and Golden State Water Company had water conservation materials. Transition Town had a table too. We assisted at the SLO Partners for Water Quality Booth. This year we assisted the LOCSD in their debuting of the Sammy the Steelhead Board Game at the Baywood School Art & Science Expo! "Saving Our Water One Drop At A Time"
was held at the South Bay Community Center in Los Osos on September 13, 2008. Over 25 non-profits, businesses and all three of Los Osos' water purveyors (for the first time ever) appeared in the same event to promote water conservation and water-use awareness. to decision makers on their wishes to preserve water for the future. Baywood School has an annual Art and Science Expo. This was out first year to participate. We asked kids to draw and/or write what they did today or will do tomorow to save water. We'll take their art for display at our booth at the County's WaterFest in Atascadero in May. Waterfest 2008 was held in Atascadero's Sunken Gardens this year and it was WH2O's first year to participate. The theme of our booth was provided by Los Osos' Baywood Elementary School student artwork, "A World Without Water." This was the Count's second year sponsoring the event and it was a huge success. 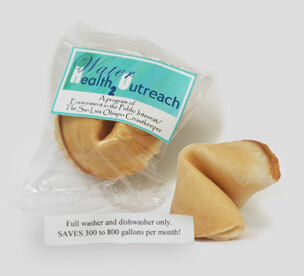 Oktoberfest for WH2O meant a table of water-tip handouts and our special fortune cookies with water-wise tips. The Los Osos CSD Water Department was also on hand with a great booth. Visit us next October - 2nd Street at 9:00 a.m. In Los Osos, a great deal of total water used is from use inside the house. Can you save money? We showed you how - we had our laptops and a printer to print out your own household water audit. The dual flush toilet that was won with a FREE raffle ticket, made one household very waterwise! Residential irrigation (once known as a "sprinkler system") has come a long way. This event focused on how changing and checking your sprinkler heads and watering patterns can save water - and money! The freezing winter weather we had damaged or killed many plants. This event helped show what plants might replace the ones you lost with water-wise, hearty and beautiful new ones. Mulching and composting were topics, too. © Water Health 2 Outreach, 2018. All rights reserved.